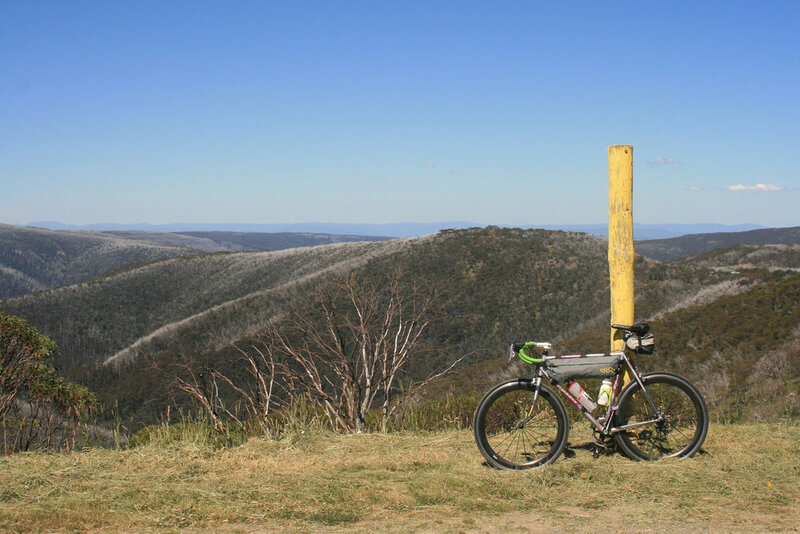 Wangaratta to Harrietville (102km)-this mainly flat ride takes you through the Ovens Valley, past the towns of Myrtleford, Bright and Harrietville. This region is worth lingering in due to the number of things you can do there. There are many local goumet delights (wineries, breweries, cheeseries, etc), and many cycling side trips on offer, such as the climb up Mt Buffalo, the climb up Tawonga Gap, and a fantastic mountain bike trail network just outside of Bright. This section can also be done largely off road by following the Murray to Mountains Rail Trail, which roughly parallels the Great Alpine Road between Wangaratta and Bright. Harrietville to Omeo (86km)-The road up Mt Hotham is one of Australia's hardest and most iconic climbs, so be prepared for pain. The Climbing Cyclist website has a detailed breakdown of the climb. The good news is that you'll be treated to some amazing views, and once you reach Hotham Village there is a fair bit of downhill to the town of Omeo. Overall though, it's a gruelling section, so allow plenty of time and take lots of water and snacks. On this section supplies can only be obtained at Hotham Village (km133) and Dinner Plain (km145). Omeo to Bairnsdale (122km)-You'll get some long downhill runs through open farm country before the road joins the Tambo River after Ensay (km233). The rolling ride along the Tambo is quite scenic, and there are a number of opportunities to bush camp or go for a swim along here. Note that there is a fairly long stretch between Swifts Creek (km215) and Bruthen (km284) where no supplies are available. About 1km after Bruthen the East Gippsland Rail Trail crosses the road (there is a sign marking it), and if you take a left onto it, it will take you all the way to Bairnsdale. The surface is mainly gravel and a bit patchy but can be done on a road bike. Taking the rail trail cuts out a couple of climbs and avoids traffic-this last section to Bairnsdale is the busiest of the whole ride. Accommodation and services are available in most towns en route. Bright, Hotham Village and Dinner Plain are pretty expensive, but The Golden Age Hotel, a grand old art-deco building on the main street of Omeo, is charming and great value-fifty bucks will get you a basic room and an all-you-can-eat breakfast which includes bacon and eggs! There are many bush camping opportunities, with some particularly nice spots on the banks of the Tambo River between Ensay and Bruthen. In the colder months there's plenty of snow in the alps, so only go then if you're well-prepared and hardy. The Great Alpine road is a well known tourist road so it's pretty busy in the summer holiday period. The best time to go is in the warmer months but outside of school holidays, as the traffic is light during these times. Be aware that it can be cold, wet and windy at any time of year in the high mountains. V-line runs three train services a day between Melbourne and Albury (which stops at Wangaratta) and three services a day between Bairnsdale and Melbourne. Hema High Country Victoria-excellent detail map printed on waterproof paper. Covers the whole ride.